Individual Variation: Nuisance or NECESSARY? To study individual behavior in the lab we tag each with a unique color combination. These tags are not commercially available and are instead made from craft beads. I’ve always been curious as to what makes animals tick. Specifically, I’m interested in why behavior varies so much between individuals of the same species and even closely related family members. This is a concept that we can all relate to. We all have a crazy cousin, quirky sibling, or a parent that you are embarrassed to introduce to your friends. While human differences in behavior may just make for awkward family reunions, in other species they may increase a population’s ability to survive in a changing environment. A child navigating grade school quickly learns that behaviors that were popular in middle school will not survive very long in high school, and certainly not college. In nature, this is similar to an animal needing to behave differently in hot, dry conditions compared to a climate that is cold and wet. However, unlike maturation through childhood, natural environments fluctuate on many different scales. There are daily, sometime hourly, changes in weather, seasonal differences in climate, and multi-year differences attributable to climate change and human environmental impacts. Added to that, habitat quality can be very different across the environment. Two areas separated by only a few feet can differ wildly in their ability to sustain a species. In order for an individual to keep track of all these changes they must be ‘plastic,’ meaning they can quickly change their behavior to suit the conditions around them (or move to find better conditions). However, not all individuals are equally plastic. And, while we know that plasticity increases an individual’s ability to survive, we don’t know how it effects population and species survival, and whether plasticity is a trait that can be directly conserved. We also don’t know whether differences in behavior we observe in nature are random or are truly adaptations to survive life in a complex world. This brings me to my research goals. I am studying individual behavior in brook trout to determine the causes and consequences of behavioral variation. Below I’ve highlighted the questions my research addresses with a quick highlight of the methods I use. More details and research progress can be found in my blog posts. How do populations differ in behavior? To determine this I measure animal personality across brook trout populations in Loyalsock Creek. What causes differences in behavior? I’m collecting tissue samples to determine if there is a genetic underpinning to movement and personality. How does animal personality influence movement? I’m using telemetry to pair measurements of personality to movement rates. Why are animals moving? The telemetry study is done across three seasons at four streams. I am also collecting data on water temperature and stream flow. At the end, I’ll be able to tell if these variables influence movement and how the habitats the fish moved from and to differ. Does personality matter for conservation? I’m conducting research in an artificial stream where we can mimic rapid changes in water temperature (simulating climate change scenarios) to see how different personalities react. 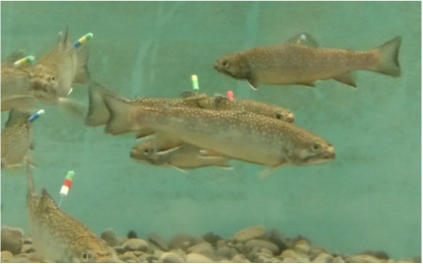 Why this study and why brook trout? Brook trout are commercially and culturally important to the east coast (and the prettiest fish, in my unbiased opinion) and this study will help inform management plans for the species. This research has benefited from the assistance from a small army of people and organizations and funding from even more. The abbreviated list of collaborators includes the National Science Foundation, the United States Geological, the Susquehanna University Freshwater Research Initiative, Penn State University, and Randolph-Macon College. All for the love of brook trout.